The PCB10 is designed to combine multiple PV source circuits into one output circuit. This combiner allows up to10 fused input circuits in a lockable, conduit-ready and rainproof 3R enclosure. 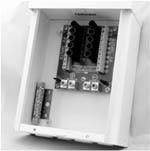 The PCB10-NEMA combiner is the same assembly, housed in a NEMA 4X outdoor fiberglass enclosure. PCB10 combiners are UL listed for 12, 24 or 48 VDC PV systems, maximum open circuit voltage of 125VDC. Each combiner circuit can accept up to 15 amp fuses, type MDA or ABC (PCBF-fuses are sold separately in packs of 10), with the maximum combined PV source circuit current rating of 64 amps. Each input circuit is ‘ZNR’ surge protected and will accept #10AWG conductors including ground bar. The positive and negative outputs are equipped with dual rated #1/0 AWG lugs.